Is he a bear cub? Is he an Ewok? Or… is it Dewars after a bath?!?! The end of last week and this past weekend COMPLETELY got away from me! Chalking it up to puppy raising, house projects, and hatch chili roasting. In fact, the ingredient spotlight for bleu cheese that went out on Sunday wasn’t even supposed to go out! Accidental scheduling and not including all of the awesome fun facts about those tasty moldy cheeses. So look for an updated post about bleu cheese down the road, as well as more posts this week — plus catching up on all your wonderful blogs!! Thank you 🙂 We definitely think so. Being a puppy mama keeps you hopping! I been there with the two of ours. They truly are babies!! That puppy is so cute, raising a puppy is a lot of work but so much fun to see them grow and thrive. He is just adorable. Wow, he’s growing so fast! geeze this little guy is just the cutest! how’s it going with raising him!? Ha ha, he is adorable! I have published by mistake several times, no worries, just glad to know what happened! I kept thinking, am I missing some deep message here~~~is it a wordless Monday instead of Wednesday? I think the thing that really got me was that I LOVE bleu cheese and I didn’t want to miss any of your marvelous tips or recipes! Awww! I could admire him all day! 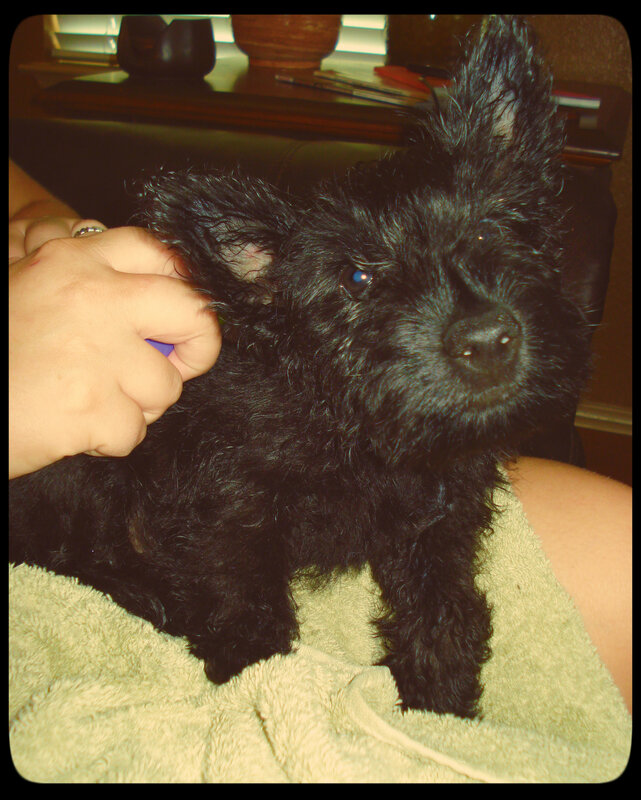 This entry was posted on August 20, 2013 by Jessica Romigh in General and tagged bear cub, Dewars, Ewok, puppy, Scottish Terrier.